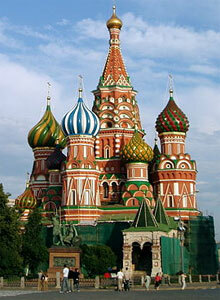 Its official name isn’t St. Basil’s. Perhaps non-Orthodox Americans’ most familiar Orthodox temple (church), an unintended virtual – and ironic – symbol of the Soviet Union and the Cold War because of its strategic / photogenic location on Red Square just outside the Moscow Kremlin, is officially called The Cathedral of the Protection of the Mother of God (or Intercession, or Holy Virgin, or Theotokos) on the Moat. The cathedral’s museum custodian would like to remind us of the fact! Wikipedia has details. While this Cathedral isn’t inside the Kremlin complex, the Kremlin itself contains several additional cathedrals, along with government buildings, etc.